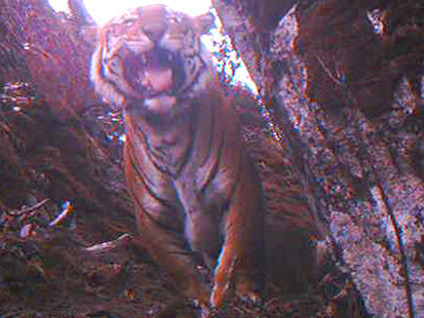 BBC camera crews have discovered a rare population of tigers living high in the Himalayas. Video footage captured by dozens of cameras with motion sensors, which had been left in the mountains of Bhutan, showed the animals - usually found in jungle habitats - at altitudes above 13,000 feet. "These are the highest living tigers in the world," said BBC cameraman Gordon Buchanan. The footage was obtained by the BBC's Natural History Unit for the series, "Lost Land of the Tiger," which debuts on British television this week. The British documentary group had traveled to the Himalayas to investigate claims by locals that there were tigers in the area - well above the tree line. "If that's true, that's a really big deal," naturalist Steve Backshall told the BBC. Experts say it is the first proof that tigers can live and breed at extremely high altitudes. The discovery could bolster conservation efforts by helping forge links to other tiger habitats in Asia. Bhutan officials promised to use the news to aid conservation efforts. According to the United Nations, there are only about 3,200 tigers living in the wild. A few tiger subspecies - the Bali tiger, the Caspian tiger, and the Javan tiger - are already extinct. Earlier this year the secretary general of the Convention on International Trade in Endangered Species (CITES) said the tiger is on "the verge of extinction." Poaching and the illegal trade of tiger products continue to threaten the animals. Click here for information on the series, "Lost Land of the Tiger." To watch a BBC News report of the discovery click on the video player below.